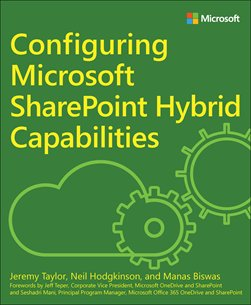 We’re happy to announce the availability of our newest free ebook, Configuring Microsoft SharePoint Hybrid Capabilities (ISBN 9781509302437), by Jeremy Taylor, Neil Hodgkinson, and Manas Biswas. In spring of 2016, Microsoft announced the general availability of SharePoint Server 2016, which includes new hybrid capabilities that make it possible for on-premises customers to tap into the innovation the company is delivering in Microsoft Office 365. For more than a decade, Microsoft’s customers have relied on SharePoint to power teamwork, to automate business processes, to create business applications, and to build company-wide intranets. As a core part of Office 365, SharePoint provides content management and collaboration capabilities that are seamlessly integrated with the other applications people use every day to create and coauthor documents, meet and work with their teams, brainstorm, analyze, and make decisions. SharePoint is also integrated with the powerful cross-suite capabilities of Office 365, such as Office 365 Groups, the Office Graph, and governance controls for security, privacy, and compliance. Our vision for SharePoint Online in the cloud and SharePoint Server on-premises extends into a connected extensible hybrid experience in which users can take advantage of the powerful features of both SharePoint Server on-premises and the innovation we are delivering in SharePoint Online. Device-independent collaboration and file sharing through Microsoft OneDrive for Business, coupled with intelligent intranets driven by modern team sites, publishing and business applications on your desktop, and mobile device lead the charge in providing new ways to work. SharePoint Server also delivers cloud-born innovation through hybrid capabilities and experiences that span, integrate, and unify on-premises farms and Office 365. With hybrid search, we have delivered an improved user experience that unifies the index, query results, and search experience across Office 365 and on-premises farms running SharePoint 2016, SharePoint 2013, and even SharePoint 2010. Hybrid search also makes on-premises content available within Office Graph– powered applications such as Delve. Hybrid OneDrive provides businesses with a stepping stone into the Office 365 experience, paving the way for the gradual migration of personal sites to SharePoint online. With the Hybrid Sites feature, you can connect users to their favorite teamsites, whether on-premises or cloud based. External sharing polices provide granular control of the sharing experience, providing businesses with the ability to securely collaborate with partners. IT professionals can also use hybrid configurations to unify compliance policies and auditing. With these and other integrated, unified, and hybrid experiences and services, you can take advantage of innovation and capabilities in Office 365 while maintaining workloads on-premises that are not suited to Office 365. You can move workloads to Office 365 at your own pace, based on your own requirements, and still take advantage of Office 365 where it best meets your needs. Additionally, the SharePoint mobile app will support both on-premises and Office 365 sites for hybrid customers. This ebook draws together the SharePoint Server and Office 365 hybrid workloads and user experiences in one place, providing solid guidance to meet business needs and achieve productivity goals in the cloud-enabled workplace.